We’re giving away 2 tickets for the finals weekend at the British Open at Royal Portrush in July. Enjoy the last few days of the Open when the winner gets to raise the Claret Jug, with this great prize from Joule. 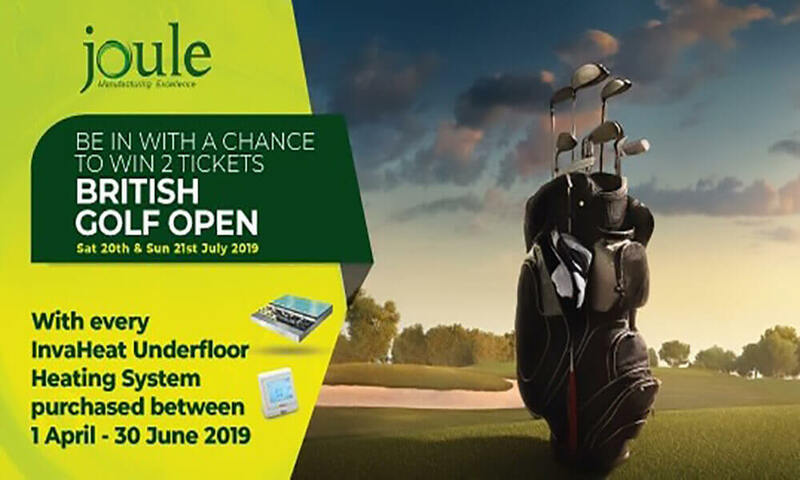 We’ll provide the winner with two tickets to the golf on Saturday 20th and Sunday 21st of July. We’ll also provide three nights accommodation in the Ballyrobin Country Lodge, where you’ll receive breakfast and dinner on each day, along with transfers to and from the golf. So you’ll get to stay Friday, Saturday and Sunday night, with breakfast and dinner included, transfers to and from Royal Portrush and the all important tickets for Saturday and Sunday’s golf. All you need to do to is purchase a Joule Invaheat Underfloor Heating system between now and the 30th June 2019 and enter the purchase details on our competition page. The competition is open to all installers of Joule Invaheat. A full list of Terms and Conditions is available here. Invaheat underfloor heating is designed specifically to work at low water temperatures, improving the efficiency of the heat pump, reducing running costs and saving you money. We design and supply underfloor heating systems to the residential, commercial and industrial sectors. In-house and on-site support is also on offer. The underfloor heating systems from Invaheat complement heat pumps, boilers and solar which are supplied with a touchscreen thermostat to complete the project with finesse. We can provide a bespoke design for each and every project. We stock a wide range of underfloor pipe fixing systems designed to work with a variety of floors. Whether it’s solid screed floors, suspended floors or floating floors, an Invaheat system can be designed to fit the bill. We’re Ireland’s leading manufacturer and supplier of energy efficient hot water cylinders. You can contact us here and we’ll be delighted to discuss any project you have planned; commercial, industrial or in your home. Keep an eye out for more great Joule competitions this month!